Space Settlement Initiative Featured in New Book "Return to the Moon"
The Woodlands, Texas, 1/27/06 - The Space Settlement Institute announced today that a chapter on space settlement written by Chairman Alan Wasser has been included in the new space-advocacy book "Return to the Moon." This book, published by Apogee and edited by Space Frontier Foundation board member Rick Tumlinson (with Erin Medlicott), is a collection of essays by more than twenty top experts and space policy leaders all bearing the same message - humanity can expand beyond the Earth to Mars and beyond, using the Moon as a stepping stone. We are in one of the most unique moments in human history. Just as the world is facing the tremendous challenges brought on by climate change - burgeoning populations pushing for more and more of the limited pie of Earth's resources, new technologies and ideologies that can threaten our very existence - there is rising above the horizon a beacon of hope. For at the ame moment in our history, a new generation, inspired by the early voyages of Apollo, is stepping up to open the space frontier. From multi-millionaires and billionaires building their own rockets to carry average folk into space, to private space hotels and industrial plants in orbit, there is a revolution underway, overhead. A key component of the space revolution, and one which will ultimately determine its success, is how the great projects that will extend humanity's presence permanently throughout the solar system will be financed. The U.S. Government in particular is already heavily loaded with debt and the costs associated with wars and pressing social issues. The financing must therefore flow from the only other viable source - the global private sector. To create an enormous incentive for weathy individuals and privately held corporations to contribute to the settlement of space (and to design it so they contribute eagerly, even aggressively, in their own interest because it is good for their bottom line) has been Alan Wasser's mission for more than two decades. In his Space Settlement Initiative essay in "Return to the Moon," Wasser outlines in detail a space property rights initiative whose purpose is not the creation of celestial property rights per se - for some property rights regime would naturally evolve in any case - but instead the establishment of legislative rules for "land claims recognition" on the Moon and Mars that require financing and accomplishments in advance. In other words, those who can pay to play do so, building with their own money the space infrastructure (the launch vehicles, cargo transporters, orbital facilites, refueling stations, lunar surface facilities, and so on) that enables them to not only do business in space, but also to collect the windfall profits from thousands of square miles of lunar land that can later - after a permanent human settlement is firmly established on the Moon - be resold on the speculative market and to long-term investors. In addition to Wasser's essay are other diverse and fascinating pieces by well-known space advocacy experts such as Dr. Paul Spudis, Howard E. McCurdy, Alan Binder, Dennis Wingo, Frank White, and Steven Wolfe, and many others. Anyone who has ever dreamed of one day visiting the first city on the Moon, scaling the slopes of Mars' Mons Olympus, or taking a day-trip to a near-Earth asteroid should check out what those who are helping make it a reality have to say about how it can be (and is being) done. 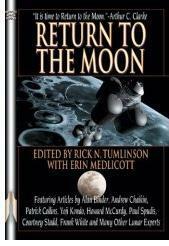 "Return to the Moon" can be purchased at your local bookstore or online through Amazon.com. Note - The Space Settlement Institute does not receive any proceeds from the sale of this book.